Patricia Krause (Pat) LMT, MA67590 is a state licensed massage therapist who has maintained the necessary training, state and county licensing and malpractice insurance required by the industry overseers. She is a current member in good standing of the Florida State Massage Therapy Association (FSTMA). Pat provides Swedish and therapeutic massage. She incorporates hot packs, essential oils and a variety of holistic energy healing modalities in her treatments. 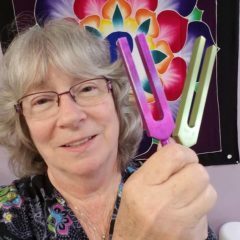 Her specialty is in vibrational sound treatments using tuning forks and also incorporates Reiki, Biotherapy and gemstone therapy in her massage sessions. This is my story, my spiritual journey and why I am here to serve. I spent over 30 years in the Technology field as a Software Engineer and IT Professional. I have been thinking that there must be more to enjoying life than sitting behind a desk and computer all day long. Personal happiness, joy and stress free living is my goal. I have been studying Science of the Mind for over 25 years and continue to read and study many metaphysical and self-help books in an attempt to figure out who and what I truly am. I always try to keep an open mind about every topic of conversation and always treat people the way that I want to be treated, with love, respect, kindness and caring. I found that if I follow my intuition (that little feeling or voice inside) it is always right. Coming from a scientific background I have always been analytical and have a curiosity to know the details of how things works. I have learned about the various religions, psychic abilities, scientific theories, art and music and realize that none of these things are separate. I have learned about belief systems and how every individual has one. I learned that there is a common element to everything in my world and it is ENERGY! It is everywhere and in everything! I believe that we are energy beings or spirit and we create our own worlds by our belief systems. When I think with focus and intent, I manifest that experience, whether it be positive or negative. I am learning to be aware of what I’m thinking so that I don’t create negative experiences. I have created UEM to provide YOU with healing modalities such as massage, reiki, sound, vibration and gemstone therapies to assist you in pain and stress relief by using these methods to relax your tense muscles, calm your nervous system and cleanse and balance your energy fields (Chakras) in order to return your physical body to optimal performance. Won’t you join me in relaxing, renewing and enjoying our physical existence here on Mother Earth?